Dr. Nudrat Jahan is an Assistant Professor. 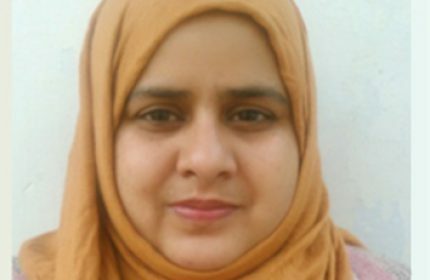 She has done her Ph.D. degree in Psychology (Specialization–Clinical) from Aligarh Muslim University. She has taught there Social Psychology, Developmental Psychology and practicum courses at graduation level. She has completed her Masters and Graduation in Psychology from VBS Purvanchal University, Jaunpur. She has done P.G. Diploma in Counseling, Guidance and Psychotherapy from MG Kashividyapeeth, Varanasi. She is a trained psychologist from VIMHANS, New Delhi. Previously she worked in Amity University, NOIDA, as a counselor for providing guidance and career counseling to young students. She has presented 11 papers in 9 national/ International conferences. She has written and published 6 research papers and chapters in reputed books and journals. Dr. Jahan is currently teaching Psychotherapy, Basic Psychology, and Cognitive Psychology courses at Graduation and Masters level. She is supervising 2 Ph.D. scholars. Her current research areas are Conversion Disorder and Childhood Depression.